I feel like shaking everyone and saying, don’t you get it? We don’t need a Movement of Movements – we are a movement of movements. My friends, we have been trapped in old dominant paradigm thinking. We have been steeped in warmongering, hierarchical, competitive, control-based mindsets since birth. We think we are lacking something, or that we’re ineffectual at organizing, or we’re failing. We call for a Movement of Movements, like the War to End All Wars, a rallying cry that will amass the allies on the edge of the battlefield so we can massacre our enemies. It makes me want to laugh – and cry. We want to name, label, categorize, and control the emergent phenomenon of this revolutionary resistance. 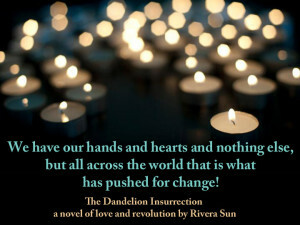 We want to take the wild flurry of activity that is erupting on a thousand fronts and turn it into an army for change. We want to call it something because then we can control it. This is what our lineage of science and religion has taught us: if we give it a name, it is ours. If we trademark the Movement, we can capitalize on it. If we organize it all in one place, we can make it work to what we consider its highest potential. We need to let go. We need to surrender to this very large phenomenon and join with it. We need to trust each other, the causes, and the organic, emergent nature of what is happening . . . this is revolutionary. This is a way of participation that is radical in our society. The long history of invasion, conquest, genocide, wars of aggression, and abuse of people and the planet has indoctrinated us in false beliefs that we must organize everything in order to survive. But these old patterns of competition and control are a worldview perpetuated by the wealthy elite, who profit from such mentalities at our expense. To this end, they have abused the theories and philosophies of the Judeo-Christian God and Darwin, alike. They school us in fear-based, violent mindsets to ensure that we will never pose a serious threat to their dominance. If we do not emancipate our minds from their worldview, we will remain blind to the greatest strengths of our movements. We are a thousand points of light. Building a Movement of Movements seems to be the logical, strongest, and wisest approach to breaking our opponents’ power, but our real strength may lie in our myriad movements. The empowered elite are fighting us on all fronts. We have them surrounded on all sides. Our plethora of issues distracts them, divides them, and weakens their centralized position. They sit in the fortress of wealth and power, staring wild-eyed into the living, breathing, diverse jungle of opposition. There is nothing they would like more than to see us assemble all of our strength in one place and march down the road to their fortress. Then they could destroy us in one swoop. So, from the balustrades of their socio-political system, they taunt us and mock us, calling us disorganized and inefficient. We are not disorganized. We are organized differently. We must learn to look at the interconnections of our myriad causes and wage struggle through collaboration, not control. Our causes are not at odds with each other, nor do they need unification under one name or coordination from a central command. Instead, we need to collaborate strategically, using our diversity of issues as our strength. If we look at the overlapping issues of health, economy, jobs, peace, surveillance, education, energy, housing, environment, democracy, and so on, we will seethat every movement is working to replace destructive, corrupt systems with constructive, life-supporting, sustainable alternatives. Our strength lies in our inherent unity, not in the label attached to it. Our only weakness is in our uncertainty . . . and the fact that we remain unaware of the power of our situation. 1) Celebrate other’s achievements; the success of one cause is the success of the whole. 2) Support each other’s efforts through solidarity, encouragement, resources, media campaigns, etc. 3) Take time to analyze the interconnections of the movements. Search for untapped strengths and sources of support. Identify pivot points of change and opportunities for other movements to help sway a critical element of your own movement. 4) Talk with each other. Find out how your efforts overlap and look for opportunities for strategic collaboration. Our movements are revolutionary; their manner of collaborative, horizontal organization is the most natural, organic system on Earth. We terrify the empowered elite because we reflect, in our very structure, the most powerful force on the planet: Life. In what they call our disorganization, we embody the natural systems that the patriarchal, Puritanical European colonizers have been trying to repress and control for thousands of years. Our movements are as frightening to them as a liberated woman, or the pagan religions of old Europe that succumbed to the first invasion of the mentality that now engulfs the empowered elite around the globe. We are organic and uncontrollable . . . and we are, ultimately, unstoppable. Instead of codifying our movements under one name, we must learn to recognize who and what we are. We are a movement of movements, a great multiplicity of motion. We are a thousand points of light. We are Life, itself. New paradigm vision. Happy to share this one and tweet it out. I would encourage us Occupiers to consolidate our efforts with the Moral Monday Movement (I’m a veteran of around 20 MM events). Do not be phased by this non-partisan religious based movement. It is an ALL inclusive movement that understands the separation of church and state. If you hav never been part of an event, watch and hear this! Excellent reframe of the problem Rivera. The movement that many want to see is already here but it is under many different headings and not under one banner. The paradigm shift is a different way of seeing this world that we live in. The shift is from seeing it in conventional political terms, in terms defined by Republicans, Democrats, Capitalists, Industrialists, liberals or conservative. The shift is not ideological but immediate, actual and it springs from our lives and the lives of our neighbors. It is a shift that is based in connection and contact not isolation and belonging to a group that is opposed to another group. This is about see life as it is, life is relationship and we are related to each other, the natural world and all creatures. This is a shift from how we were acculturated to seeing ourselves as we were meant to be seen, as beings in human form connected and in relationship. Thank you. I feel honored (and humbled) by your kind words. Moral Mondays is a very worthwhile endeavor. They have displayed courage, perseverance, and stamina. Consolidate or collaborate, and let’s work together in our common ground. You are a great writer indeed, with respect, if you do not object I have added you to my follow list. Now just take it to the polls ….